Here is a list of all the postings Brian Cooper has made in our forums. Click on a thread name to jump to the thread. I have far too many favourites to choose just one. They all perform differently (from mild to wild) and a "favourite of the day" will depend on the weather conditions and how I am feeling prior to a flying session. Like Graham, I am partial to a nice biplane. Flying low, four stroke engine....... Ahhhhhh. Be aware of the position of the U/C. . There is a temptation to mount it a long way forwards to prevent nose-overs but, if it is too far forward, the model will bounce around like a kangaroo every time it lands. It is better to bolt the U/C to the floor. . . Reinforce the floor first. Securing the U/C with rubber bands is something we used to do in the 1960s. . It worked up to a point, and that point was when a hard landing occurred. The U/C then had a tendency to violently flip round 180 degrees. This isn't a problem UNLESS the U/C is long enough to make contact with the wing. . . and then it punches holes in the wing. Thread: Spring is here. Who is flying? Personally, I have been flying throughout the winter months but the warmer days and lighter evenings are very welcome indeed. More flying and less clothing. When I am in Spain (more often these days) I fly from a model club's site as a guest. VERY often, microlight aircraft fly past at low level and give us a wave... some even do touch-and-goes on the runway. . Nobody knows where they come from or where they go to afterwards. . It is all a part of the way of life over there and nobody seems to mind. Thread: Does your club prohibit the use of after-market receivers? Yes, we need to have some common protocols in place for keeping us safe, but there are times when I have to remind myself that we do this hobby for FUN. Having flown R/C models for the last 55 years, it never ceases to amaze me that during all of those years there has never been a shortage of folk who conspire to dull the thrill of flying model aeroplanes. . . For example, how about a club which does not allow low passes down the runway, and allocates a specific piece of sky just in case you might be reckless enough to want to do a loop or a roll. . Trust me, they exist. . . . . . If you fly an underpowered Junior 60, you fit right in..... Yawn. The more rules you have, the more criminals you create. We prefer a lighter and less draconian atmosphere at my club. Thread: NEW POLL - Does your club have a safety officer, or is the emphasis on individual members to each be their own safety officer? During a break at our last AGM, I popped out for a wee...... when I came back, the assembled company joyfully announced I had been voted to be the Safety Officer in my absence . . . Almost as sneaky as daily life at Westminster, eh.. It is the "permit" part of the wording which clearly makes us ALL Safety Officers. Ergo, if we see someone acting dangerously and say nothing, by definition WE are breaking the law because we are permitting it. Nope, no ban at my clubs (I am in three). Dunno about that, but some years ago (Brian Cooper may remember!) Mick Wilshere was given some synthetic oil to try by Shell. The oil was brilliant! The trouble was that it smelt like putrified camel dung - whether burning in an engine or stoppered in the bottle! If you put a can of it in your car, the stench hung around for weeks! It was also very good for clearing the less hardy flyers from the strip! Oh gawd, yes. ... That Shell oil was a bit pongy. Thank goodness modern oils are kinder on the nose. Phew... Looking at the title to the thread, I thought it was going to be about recommending using castor oil. It is filthy stuff and kills engines. I really can't understand why people use it in any percentage in their fuel. I wouldn't even leave an opened bottle of the stuff in the same room as an engine. Thread: New Drone/Aerodrome Regulations - Is your club at risk? Brian, are you limited to 400 ft, or have Sywell given you permission to operate higher? We put 400ft on our request but the circuit height at Sywell is 800 ft and we are not on the circuit flightpath, so with a goodly dose of co-operative common sense, we can go above 400ft but would need to drop down if any fullsize aircraft start coming our way. . However, we will be encouraging our club members to regard 400ft as the limit. Boeing claim that the aircraft is safe. . Okay, put ALL of the Boeing management onboard and then have the aircraft do a couple of hundred hours doing takeoffs and landings (circuits and bumps). Also, if any work has been done on the aircraft, put the mechanics onboard for the test flights. Due to the new legislation, my club (Wellingborough) had to apply for permission from Sywell Aerodrome. 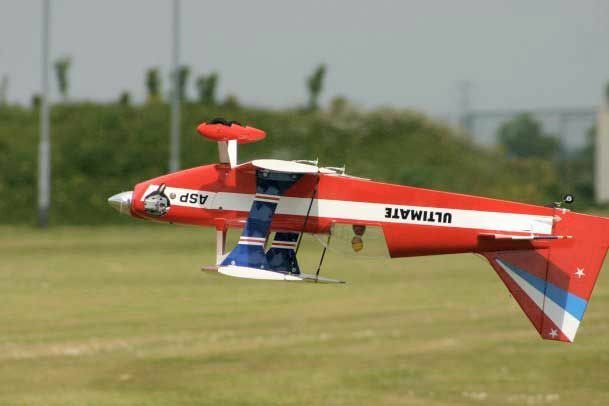 Happily, using the BMFA guidance documents, we obtained the necessary permissions to fly our R/C models. . They are also putting our club on their charts so pilots of fullsize aeroplanes are aware of our model flying activities. Thread: If you only had one engine to use, which one would it be. There are far too many good engines out there to have to go through the agony of choosing just one. If operating at the higher frame rates, analogue servos will struggle to keep up, but servos which are slow, won't centre, or bounce at normal frame rates are definitely not working properly. If you have got a brand new one which is dead when taken out of the box, it doesn't bode well for the quality of the product or for the manufacturer's quality control. Get your money back and buy servos of better (branded) quality. Thread: What Sports Aerobatic for an ASP 70 Four Stroke? A Wot-4 with an ASP 70FS is a good combination for sports aerobatics. . The power to weight ratio gives an impressive vertical performance, and the model really comes alive with some decent grunt in the front. . It will put a smile on the most experienced pilot's face. Yes, the RPM figure is a little low. Hopefully it will loosen up with some more running. A 15x8 is the right size prop. I am getting about 8,800 RPM with an APC 15x8, running 10% nitro Prosynth fuel.